Predictive Analytics, Big Data, Hadoop, PMML: PMML in Action: A practical look at PMML, the standard to represent data mining models. PMML in Action: A practical look at PMML, the standard to represent data mining models. PMML (Predictive Model Markup Language) is the de facto standard used to represent and share predictive analytic solutions between applications. This enables data mining scientists and users alike to easily build, visualize, and deploy their solutions using different platforms and systems. This book presents PMML from a practical perspective. It contains a variety of code snippets so that concepts are made clear through the use of examples. PMML in Action is a great way to learn how to represent your predictive models through a mature open standard. The book is divided into six parts, taking you in a PMML journey in which language elements and attributes are used to represent not only modeling techniques but also data transformations. With PMML, users benefit from a single and concise standard to represent data and models, thus avoiding the need for custom code and proprietary solutions. You too can join the PMML movement! Unleash the power of predictive analytics and data mining today! Available now on Amazon.com. "The very first book that covers the industry standard for transferring and integrating predictive models across systems, this is a milestone for predictive analytics. If you want the long and short on engineering for versatility in how predictive models can be deployed and put to work, get started by curling up with this book." "Open standards facilitate innovation and progress (web is a great example). PMML (the Predictive Model Markup Language) is an open standard for predictive analytics and data mining, developed over more than 12 years and supported by most industry leaders. 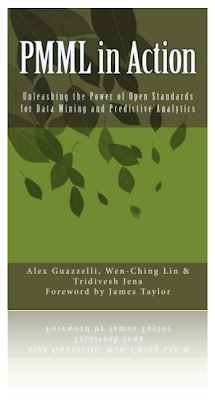 This easy to read book covers data transformations, many modeling methods (Associations, Clustering, Decision Trees, Neural Nets, Regression, SVM, and more), model ensembles, and verification. This book is your essential guide to PMML !" "Next generation enterprise are going to be driven by analytics, especially predictive analytics. Sharing and rapidly deploying predictive analytic models is essential and PMML is the open standard that delivers the interoperability and agility that these predictive enterprises need." “PMML in Action may be destined to become an analog to the famous Kernighan and Richie book, "The C Programming Language", published in 1978. This book (affectionately known as K&R) became the standard guide for ANSII C programming practice. I expect that "PMML in Action" will function likewise in the burgeoning development of PMML in analytical tools now, and in the future. It is the "cookbook" for PMML programming. Julia Child made French cuisine kiss-simple for housewives to create. Now, programmers can follow the descriptions and practices in this book to implement analytical solutions in PMML as easily and efficiently as Julia enabled a housewife to make a French soufflé."